It was proof that text-messaging tweens don't rule the "American Idol" universe. Confirmation that America appreciates a boy who can rock. 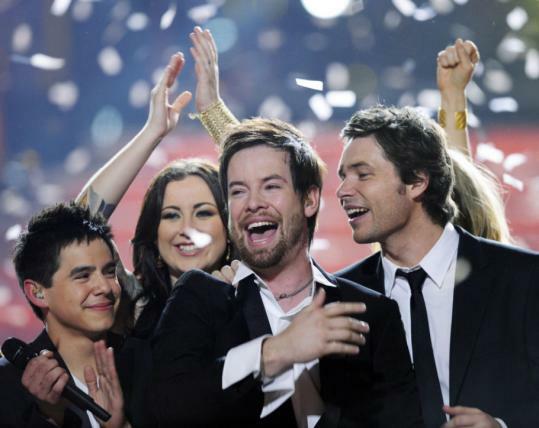 In last night's season-seven "Idol" finale, David Cook, the versatile guitarist with the slightly gritty voice, beat David Archuleta, the baby-faced balladeer. The rocker shed tears through his eyeliner. The balladeer smiled. And for a few moments, the world seemed topsy-turvy, in a good way. Once the confetti clears, will these results cement anyone's future? Not necessarily. As past "Idol" contestants such as Chris Daughtry have shown, winning is good but not essential - except as a matter of bragging rights for fans. Still, Cook's success suggests a strong market out there for a rock-star mensch. "Idol" host Ryan Seacrest told the crowd that of 97.5 million votes cast Tuesday night - 23 million more than the previous "Idol" record - Cook took an impressive 56 percent. That marks a curious twist to a season that started out looking like an Archuleta gimme, and a final showdown that played to Archuleta's strengths. Even the judges seemed to backpedal last night: Simon Cowell, who declared Tuesday's show an Archuleta "knockout," announced that he'd rewatched, and "it wasn't quite so clear-cut." Perhaps Cook's win proved that the performance show didn't matter; this season, loyalties were declared early, and the fanbase was deeply divided. Depending on whom you asked, Archuleta, 17, was either a soul of incomparable purity or a meek boy who needed to be rescued from the stage. Cook, 25, was either charmingly sweet or disconcertingly smug. Last night, Cook seemed to demonstrate genuine sweetness, making brotherly gestures toward Archuleta, hugging his mom when he won, and doing his best to make a coronation song called "Time of My Life" sound palatable. He also got to rock, singing "Sharp-Dressed Man" with ZZ Top. It was one of the highlights of the two-hour finale, along with some charming duets: Syesha Mercado crooned with Seal, while Brooke White, the barefoot nanny, sang "Teach Your Children" beside Graham Nash. Donna Summer, Bryan Adams, the Jonas Brothers, and George Michael made appearances, as did Ben Stiller, Jack Black, and Robert Downey Jr. Still, the show felt more like a swan song for ousted performers - and a plug for this summer's "American Idols Live" tour - than simply a celebrity parade. Of course, the producers still found time for filler, reminding us of the long audition freakshow and promoting the new Mike Myers movie, using poor Archuleta and Cook as comic foils. Indeed, "Idol" and its zealous sponsors seem to ask more of contestants every year: In addition to kibitzing with Myers and learning choreography, both finalists somehow took the time to film "Risky Business"-style commercials for Guitar Hero. On the other hand, that bit of air guitar was telling. Cook looked comfortable, and Archuleta seemed to be having the most fun he'd had all season. If, once his "Idol" tour duties are done, he gets to go home and play video games for a while, then the results wouldn't be half bad. Critic's Notebook Why has 'Idol' fallen into predictability?